I’m fascinated by history and wish I could transport myself back in time so I could meet the people who lived during different eras. Women in the Wild West had to be brave, strong, and resourceful, all qualities I admire. I wanted to write a heroine who embodied those qualities, and I hope I succeeded with Grace. 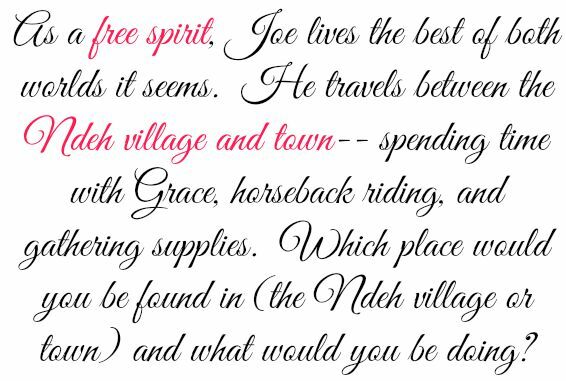 Most likely you’d find me in the Ndeh village because I’m drawn to their lifestyle and philosophy. I expect I’d be cooking, making clothes, and gathering herbs for medicine. Interestingly enough, I was researching a nonfiction book on native peoples and was drawn to the Southwest. I spent time in Arizona, visiting some of the sites mentioned in HER COLD REVENGE. I took art lessons on a reservation and spent time in the desert. I had those experiences to draw on as I wrote, but I also contacted experts on many different topics and did a lot of research online as well as in libraries and historical societies (spending some time as librarian really helped me develop my research skills). That’s a hard choice because I love them both. If I had to choose one, it would probably be Grace. My first choice for an activity would be galloping on horseback. I’ve always been a horse lover as far back as I can remember. I’d like to think I’d be as brave as Grace and capture criminals, but I’ve never put my bounty hunting skills to the test (except on the pages of the book). One other character I’d like to spend time with is Emily. You meet her in HER COLD REVENGE. She’s a plucky little girl who idolizes Grace. She hurtles headlong into danger because she’s so determined to help Grace capture the Guiltless Gang. I love her loyalty and headstrong nature. What an interesting question. I think she’d take a Ndeh name, Eagle Feather, to symbolize the justice she metes out. She wears those eagle feathers in her hatband, one for each gang member she’s determined to capture. I already mentioned how partial I am to Emily. I’d love to see what she’s like when she reaches Grace’s age. I suspect she may end up being a sidekick for Grace. 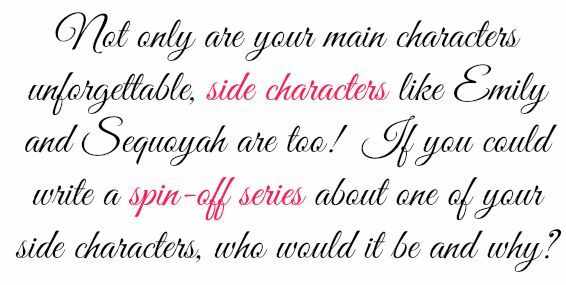 Sequoyah would be fun to write. I’d have a harder time doing a series with her because in those days, the Ndeh were in hiding. It would be a creative challenge to stay true to the time period and give her the opportunity to have adventures. I’d enjoy spending more time exploring the Ndeh culture, though, so I may have to give this some thought. I found the first chapter of GRACE AND THE GUILTLESS the most heart-wrenching part of the series to write. 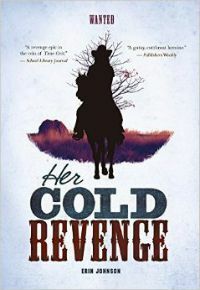 In HER COLD REVENGE, I struggle to keep Grace’s attraction to Joe from overpowering her goal of bringing her family’s killers to justice. Everyone always says to read, read, read, and read some more. That’s important, but it’s equally important to write, write, write. Write anything – journals, lists, poetry, letters to the editor. Any time you’re putting words on paper, you’re practicing your craft. The more you write, the better you’ll get. I read once that it takes 10,000 hours to master a craft, so every time you put pen to paper (or fingers to keyboard), you’re logging in time. One other thing I’d suggest is to challenge yourself to write a story every week from start to finish. That will give you practice on story arcs, characterization, and plotting. After a year, move on to writing novel chapters. By then, you’ll have learned to finish what you start. Developing that habit early in your writing life can prevent a drawer full of partially finished stories. The next book will contain a Wild West show, a love triangle, and a good friend in danger. Joe and Grace’s relationship will be tested in many ways. That’s about all I can reveal right now. I have many things on my bucket list. I have other novels I’m working on, of course, that I want to see published. But one of my top goals is to travel to every continent. Next on my list: Antarctica. Thank you, Laurie J. Edwards (aka Erin Johnson), for visiting the blog today! A love triangle and someone in danger-- I am so impatient to read the third book in the Wanted series! 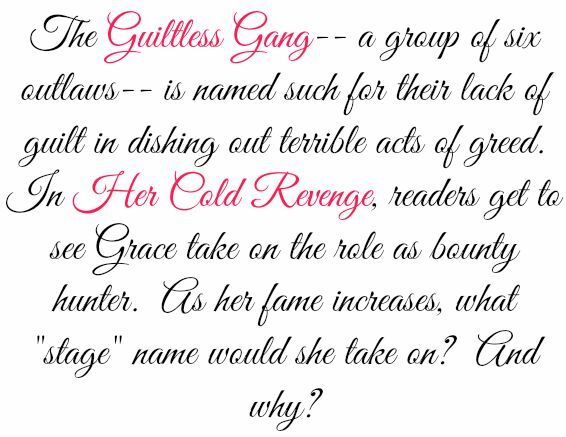 If you haven't started this series, you definitely need to check out Grace and the Guiltless (my review). Her Cold Revenge, the sequel, releases August 1, 2015. Click here to check out Laurie J. Edwards' website. Click here to follow her on Twitter.